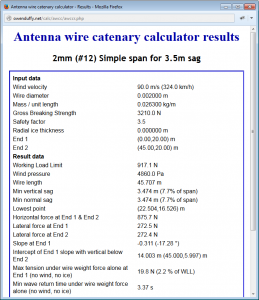 A correspondent asked about application of the Antenna wire catenary calculator to a scenario with a spring tensioner in a simple span. His proposed tensioner has a maximum length of 2.6m at a tension of 445N, and the intention is to tension the span with no wind loading to 178N at which the tensioner is 1.92m long. Minimum GBS of the tensioner is 1560N, WLL=456N (ie the tensioner is specified that with safety factor 3.5, it reaches its working load limit at full extension). 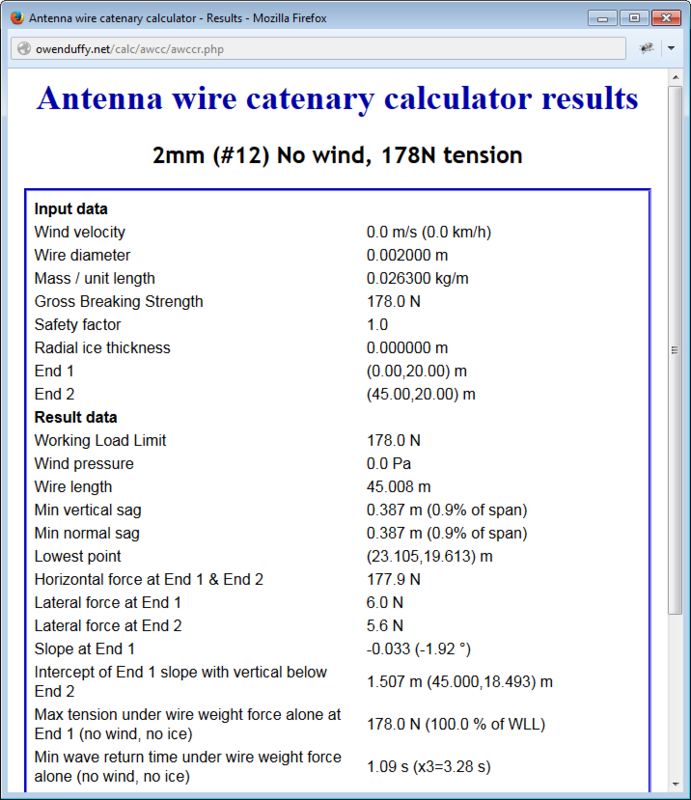 The following is a simple analysis that assumes the fixed supports are equal height, the tensioner has the same m/l as the wire, and 2mm (#12) 30% Copperweld is used for the wire which is 42m long, so the distance between supports is taken to be 45m. Above is a calculation of the span with no wind loading. The wire strength and safety factor are fudged to set the tension to 178N. 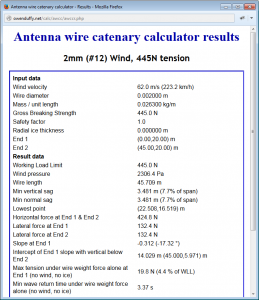 The key result here is the wire length of 45.008m. We will now solve the span for maximum extension of the spring tensioner, wire strength will be set to 445N and wind speed will be increased until the required wire length will be the original 45.008m plus the extension of the tensioner of 0.68m. Above, the span will tolerate 60m/s of wind with a wire length of 45.7m, and the sag is 3.5m… though the sag is only that great when the tensioner is stretched under 60m/s wind, with no wind the sag is just 0.4m. Above, the solution of a single span with wind increased to require a sag of 3.5m. The span will withstand wind of 90m/s, 50% higher than with the tensioner for the same sag requirement. Above is a simple span rigged to withstand the maximum 60m of the tensioner scenario, sag is 1.5m… more than the unloaded tensioner case but less than half the loaded tensioner case. Antenna wire catenary calculator can be used to model the tensioner scenario by setting some of the input values appropriately to constrain the solution. The analysis assumes the tensioner has no friction, does not jam and is otherwise working properly, and for simpler modelling, that it has the same m/l as the wire. The tensioner requires an additional 2.6m between supports, and whilst it delivers a flatter span under no wind, a plain span without tensioner to withstand the same maximum wind speed sags less under load. The tensioner has about half the WLL of the wire, ie it degrades the strength of the system. The tensioner will appeal to people who think that a flatter span is a better span, as it does deliver a flatter span under no wind.